Kayla Morris did a super job on her baby's pirate sock monkey nursery mural and is sharing it with us. This unique painting would look incredible on the wall of a pirate nursery as well as a monkey themed nursery. 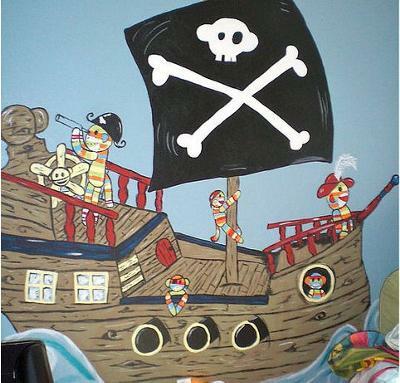 I love how the nursery mural artist moved beyond the classic sock monkey color scheme of brown, gray, cream and red (red accents strategic areas of the ship's woodwork and the crew...you have to love the sassy feather on the fire engine red pirate hat!) and instead dressed the pirate captain and crew in orange, turquoise blue and bright orange stripes on a lime green background. The colors really POP against the aged brown hull of the pirate ship. If you will take just a moment to look closely at the painted details of the combination pirate sock sock monkey nursery mural you will find many whimsical touches like the smiley face on the ship's wheel. I'm sure that this painting will put a smile on everyone's face who visits the room and that this painting will inspire many unique and creative nursery decorating ideas! I would love to know whether the mom who decorated this nursery for her baby boy used pirate baby bedding, monkey baby bedding or looked for a color match, wouldn't you? The sock monkey baby bedding sets that are available wouldn't work and it would be a shame to detract from the monkey nursery mural by using a pirate theme nursery bedding set. If it were up to me (which it wasn't but I can't help but throw in my two cents worth of decorating advice) I would have bought fabric with a black background that had a very small Jolly Roger pattern; nothing that was large enough to compete with the Jolly Roger flag in the mural, but that was in keeping with the pirate theme. Thanks so much, Kayla, for allowing me to feature your mural in our current baby nursery photo contest! Kayla, you are so talented and did a great job painting this mural! It's so cute, colorful and gave me lots of ideas for my baby boy's room. You've combined my two favorite things- monkeys and pirates! Monkey pirates? Who knew? 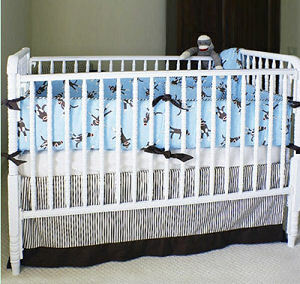 Very cute for a baby boy's nursery...but I'm expecting a girl this time around. I'm bookmarking it for the future! I LOVE this room!!! It's different from other themes out there-so creative and fun for a little boy's room. Join in and write your own page! It's easy to do. How? Simply click here to return to SOCK MONKEY BABY NURSERY THEME .